In a world where everyone's fighting to sit on the Iron Throne, friendship is something of a rarity. How many genuine Game of Thrones friendships can you name? And did Arya and Gendry make the cut? It's been so long since we last saw them together that it's easy to forget when exactly they met, but they previously spent quite a lot of time together. While we wait for the final season, let's take a look back at how the two know each other. Unfortunate circumstances bring Arya and Gendry together at the end of season one. Gendry's father, Robert Baratheon, dies from a hunting injury, thus leaving him susceptible to becoming a victim of a purge of Robert's illegitimate children. Ned Stark, Arya's father, is then executed after questioning Joffrey's parentage and right to the throne. Since they both have huge targets on their backs, Arya and Gendry opt to leave King's Landing with the help of Yoren, a recruiter for the Night's Watch. The two meet when other recruits harass Arya - with newly short hair to pose as a boy named Arry - about her unassuming-looking sword. Being the little badass that she is, she defends herself, and Gendry also jumps in to intimidate the bullies. As the recruits make their way to the Wall, they're stopped by King's Landing guards looking for Gendry. Arya, afraid they're after her, confesses her real identity to Gendry. The guards and Lannister soldiers, though oblivious to who they are, end up taking them to Harrenhal as prisoners. There, Arya serves as Tywin Lannister's cupbearer and Gendry works as a blacksmith. Eventually, they end up escaping with the help of Jaqen H'ghar, who assassinates a bunch of guards. When Arya asks how he killed them, he offers to take her to Braavos to learn, but she chooses to stay behind instead (for now!). 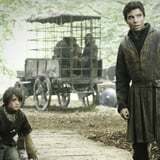 In season three, they set off to hit up Riverrun, where Arya's mother's family is from, but they instead run into the Brotherhood Without Banners. They witness some weird stuff, like a trial by combat between leader Beric Dondarrion and Sandor Clegane (aka the Hound), and Beric's subsequent resurrection thanks to a Red Priest. In one of their last exchanges, Gendry admits that he's staying with the Brotherhood because he feels they're like family. This troubles Arya, who says she and the Starks could be his family when they find them. However, unaware of his true parentage, he reminds her of the wide class difference that exists between them. Arya and Gendry ultimately go their separate ways when the Brotherhood sells Gendry to Melisandre for gold. As of season six, they're finally both in the same place and on the same side, but we've yet to see them meet up again. Here's to hoping we see an epic reunion - and that they're still friends, because any other outcome would be heartbreaking!